Aural historian Emily Thompson of the University of California, San Diego, has been named a 2005 MacArthur Fellow by the John D. and Catherine T. MacArthur Foundation. She will receive $500,000 in “no strings attached” support over the next five years. Popularly known as a “genius” grant, the award recognizes the creativity, originality and potential of Thompson’s research in the ephemeral and elusive history of the American soundscape. Thompson is the 15th UCSD scholar to receive a MacArthur Fellowship and the fifth so honored from the university’s Division of Arts and Humanities. An associate professor in the UCSD department of history, Thompson, is a faculty member in the interdisciplinary Program in Science Studies and is also an affiliated researcher with the California Institute for Telecommunications and Information Technology (Calit2) at UCSD. Thompson, 43, focuses on the often-overlooked subject of sound and fills an important gap in contemporary American history, reaching into domains as diverse as urban design and cinema studies. In her book, The Soundscape of Modernity, she integrates the histories of the United States, technology, science, sound production and acoustics to examine the transformation of the American soundscape from the turn of the century to the opening of Radio City Music Hall in 1933. In research to date, Thompson has organized her work around developments in twentieth-century architecture, such as new concert halls and new building materials, and explored innovations in the science of acoustics, the emergence of excessive noise, and the efforts of scientists and designers to create new spaces and a new, “modern” sound. Her interests have centered around changes in acoustic design as reflections of larger cultural and social shifts in American life in the early 1900s. 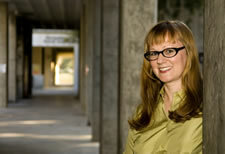 Thompson joined UCSD in February of 2005 after two years at MIT, including one year as a senior fellow in the Dibner Institute for History of Science and Technology. She has held teaching positions at Rensselaer Polytechnic Institute, Iowa State University and the University of Pennsylvania. Thompson received a B.S. in physics (1984) from the Rochester Institute of Technology and a Ph.D. in history (1992) from Princeton University. The Division of Arts and Humanities, comprised of the departments of history, literature, philosophy, music, theater & dance and visual arts, includes top-ranked programs in theater, digital arts and film, as well as Latin American and Asian history. The departments of literature and philosophy were also ranked in the top 20 nationwide by the National Research Council. The MacArthur Fellows Program was the first grantmaking initiative of the MacArthur Foundation, one of the nation's largest private philanthropic foundations. The inaugural class of MacArthur Fellows was named in 1981. Including this year's 25 recipients, 707 people have so far received the grants which enable them to accelerate their current activities or take their work in new directions.